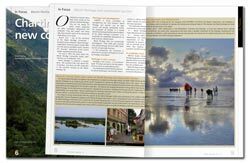 In this issue we are pleased to focus on the heritage of Africa and its sustainable development. The diversity and wealth of African heritage is extraordinary, from its large-scale ecosystems to modern architecture; from the memory of slavery and colonial heritage to cultural landscapes and sacred sites. Preserving this heritage is an ambitious and challenging task. Once we move beyond the initial efforts to inventory this heritage, we must have goals that don’t just focus on short-term gains, but work toward a larger vision: long-term sustainable development with benefits to the local communities. Part of this involves encouraging the re-investment of financial earnings from sites into heritage conservation and best practice interpretation. Effective efforts to preserve this heritage mean that we all must work together, and diverse stakeholders must collaborate for heritage conservation, not just at the local or national levels, but across borders to reinforce peace and security. 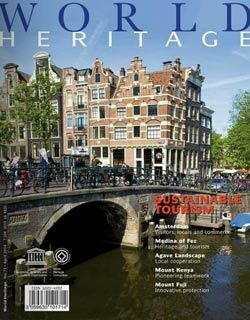 As George Okello Abungu points out in the introductory article, the question of whether heritage can be used sustainably for development seems to be no longer contested, and now the issue of heritage as a possible driver for development and community benefit has taken central stage. 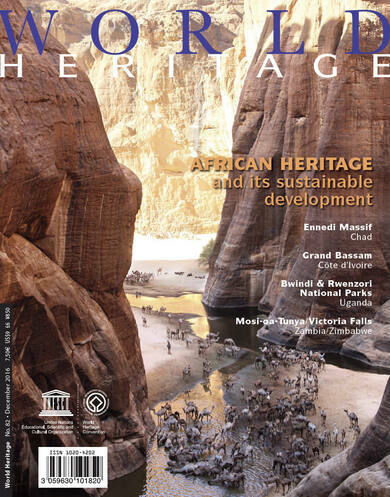 In this issue of World Heritage we look at sustainable harvesting by local community members around Mosi-oa-Tunya/Victoria Falls (Zambia/Zimbabwe); tourism development at Bwindi Impenetrable and Rwenzori National Parks (Uganda); the mixed site of Ennedi Massif: Natural and Cultural Landscape in Chad, inscribed on the World Heritage List this year; and the N’zima people and the preservation of the French District of the Historic Town of Grand-Bassam (Côte d’Ivoire). We will also look at the artisans in Timbuktu, whose expertise in preserving their earthen architecture is passed on from one generation to the next. In an interview with Webber Ndoro, Director of the African World Heritage Fund, we learn about the Fund’s accomplishments and plans for its future as it celebrates its tenth anniversary. I hope you will enjoy discovering the rich heritage of this continent, as we look forward to moving forward together in preserving its treasures for the future. The subject of African heritage and its sustainable development has become one of the most discussed issues of late, both within and outside the continent. Dialogue and collective decision-making in development through stakeholder participation is a promising strategy if incorporated in World Heritage management programmes. The Ivorian authorities work on raising awareness among civil society and young people of the importance of taking care of and protecting the country’s World Heritage assets. The inscription of the Ennedi Massif on the World Heritage List gives great pride not only to the native population but to all Chadian citizens, and will further encourage the local population to conserve and better manage the site. Despite the challenges, Bwindi Impenetrable and Rwenzori Mountains National Parks have demonstrated that natural resources can trigger sustainable development and environmental conservation. African Development Bank - Addressing cultural heritage through integrated safeguards.